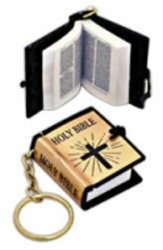 Thw World's smallest Bible is only 1 1/4" X 1 1/2" X 1/2" in size comes on a keytag. It is a great new visitor and Sunday School award. Less than $ 2.60 each in the minimum of 144. The Mini seed cross has Forget Me Not seeds impregnated into the cross. The cross measures 2 1/3" X 1 1/2" and it comes with a planting instructions card. Only a dollar each in the minimum of 100. 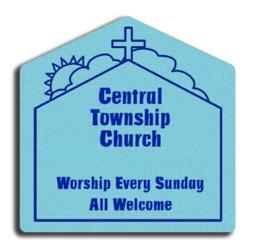 The Church magnet is 3 3/4" X 2 1/4" and in the minimum of 500 they are only $ .50 each and aslow as $ .29 each in the 1000 quantity which includes a four color process imprint. The Christian fish pen is a full sized pen with the fish shape bent into the top of the pen. The imprint area on the barrel of the pen is 3" X 5/8" and in the minimum imprintable quantity of 250 they are less than $ 1.75 each. The Magnetic box has strong little magnets plus you can custom imprint on all six sides of the box. The imprint area on the large side is 1" X 1 3/4", small side imprint area is 5/8" X 1 3/4" and the ends have an imprint area of 3/4" X 1". In the minimum quanity of 250 they are less than $ 2.35 each. 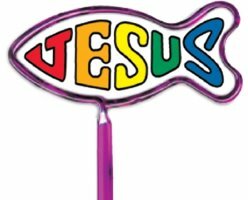 The plastic Jesus Fish measures 1 5/8" X 5 5/8" is a stock product that is available in either a closed version (as per the picture) or an open version. The closed design comes with a die cut adnesive around the perimeter and the closed design has a strip of exterior grade adhesive on the back. The closed designs are also available with strip magnet tape on the back. Available in 10 stock designs. In the minimum order of 25 they are less then $ 4.00 each. 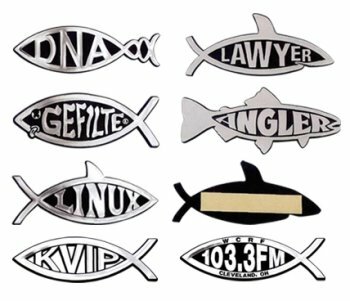 The custom imprinted version can have your text or logo on the inside of the fish design to quickly create a very unique and memorable nameplate. Automotive grade adhesive is die cut and applied to the perimeter. Minimum custom order is 50 and they are less than $ 3.25 each. Two sizes are available for our Magnetic Mirrors - the 3 1/4" X 4 1/4" size (left two pictures) and also the larger size of 3 3/4" X 4 3/4". The imprint area on the smaller size is 2 5/8" X 3" and the larger size has an imprint of 1 1/8" X 3 1/2". Smaller size is less than $ 2 each for a one color imprint in the 250 quantity and the large size with a one color imprint in the 250 quantity is less than $ 2.25 each. 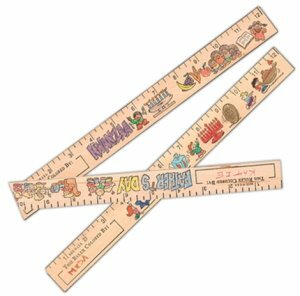 The Color Me 12" ruler can be colored by the child and it provides a large imprint area of 10" wide X 7/8" high on the back of the ruler. 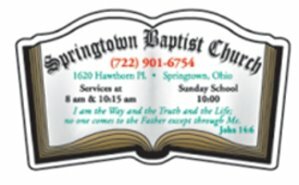 Church information such as the order of service, Pastor's name, website address, etc. can be printed on the back. In the minimum order of 250 they are less than $ .50 each. Two of the many stock designs that are available for the child to color are shown below. 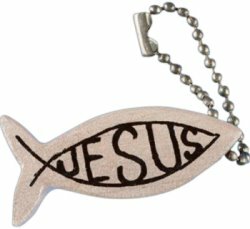 The Jesus Fish Key Chain can be imprinted on the back. Less than $ 1.35 each in the minimum of 100. 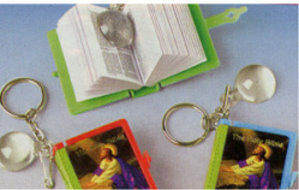 The 3" Bible on a keytag comes complete with a magnifier. Less than $ 2.10 each in the minimum of 576. 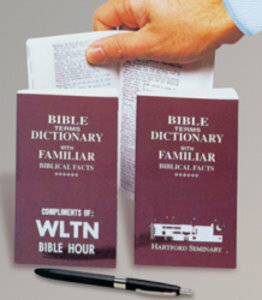 The 285 page Bible Dictionary has thousands of important names, places and things mentioned in both the Old and New Testament and are listed, prounced and explained. Special additions include a listing of Old and New Testament miracles, Prophecies and more! Maroon cover only. It measures 3 3/9" X 5 1/2" and the fromt cover provides an imprint area of 2 1/4" X 2 1/4" at the bottom. In the minimum imprintable quantity of 100 they are less than $ 3.75 each. 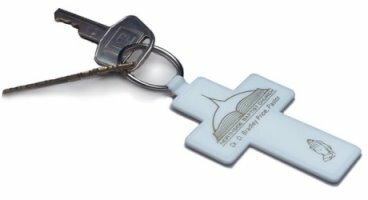 The Cross Key Tag measures 1 7/8" X 3 1/8" and it provides an imprint area of 1 1/2" X 1/2". In the minimum imprintable quantity of 250 they are less than $ .60 each. 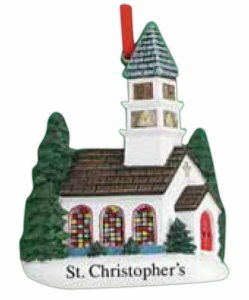 The Church shaped Jar Opener measures 5" X 5" and is available in 14 different colors. 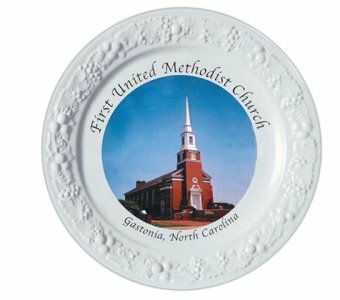 Great product for new church visitors! Imprint area is 3" X 4" and in the minimum of 300 they are less than $ .75 each. 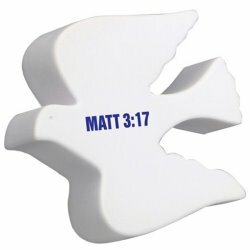 Now matter how you brand the 1" X 3 1/4" 3" X Dove stress ball, having a great promotional product like this is perfect for church functions or Christian bookstores. Safety tested and intended for adults or for general use by consumers of all ages. Our products are not intended for children under three years old or for pets. Custom imprint area is 1/2" X 2" from wing to wing or it can also be printed from to front to the back in an area of 1" X 1/2". Less than $ 2.20 each in the minimum of 150. 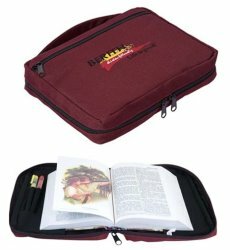 We have several different Bible Book covers to choose from. 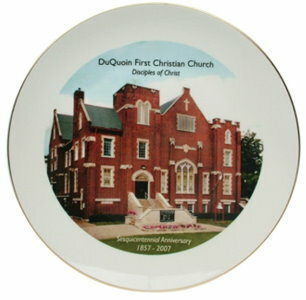 They make for great church fund raisers, awards and are economical and high quality. On the left is the nylon Bible cover that measures 7 1/2" X 10" X 2" and it provides an imprint area on the front cover of 4" X 4" and in the minimum of 100 they are less than $ 5 each. 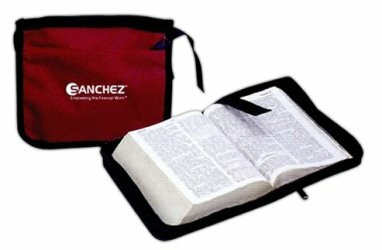 On the right is the 600 denier durable polyester bible cover with an exterior zippered pocket, zippered closure, webbed carrying handle and ribbon marker, It measures 5 1/2" X 7 5/8" X 1 1/2" and in the minimum of 72 are less than $ 4 each. They are available in Black or Burgundy. 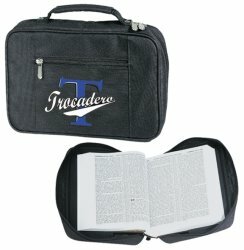 This Bible book cover measures 11" X 7 1/2" X 2 1/2" and it provides an imprint area of 4" X 4" and is available in Black only. Call us at 800 960-9080 for current pricing. We have over 200 different theme ducks and are presenting three of our Religious theme ducks below. 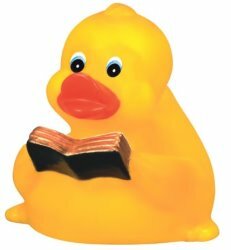 On the left is the Inspirational rubber duck that measures 3 1/2" long X 3" wide X 3" high with a custom imprint area of 1 1/8" X 1/2". 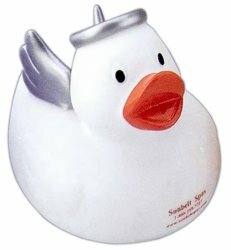 The Angel duck with wings and halo measures 3" X 3 1/2" X 2 3/4" and provides an imprint area of 1 1/8" X 1/2". 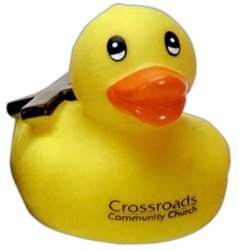 The rubber duck on the far right has a cross on its back and it measures 2 3/4" X 3 3/4" X 2 3/4". Minimum order on any of these three ducks is 50. 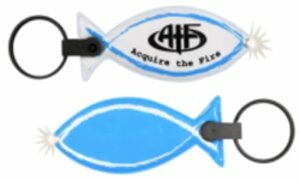 The Light Up fish keychain has a LED light and measures 2 1/2" X 2" and the imprint area is 2 1/4 X 1 3/4". In the minimum of 250 with your custom imprint they are less than $ 3.50 each.. The Church bank is made of 20 pt. high density, white posterboard and measures 3 1/2" X 2 1/4" X 5 1/2" and in the minimum of 250 it is less than $ ,92 each. 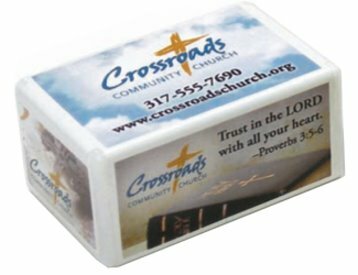 The 2" X 3 1/2" X 2 1/2" Church shaped stress reliever provides a custom imprint area on the side of 1 1/2" X 3/4" or on the back in an area of 1 3/4" X 7/8". Less than $ 1.40 each in the minimum order of 150. 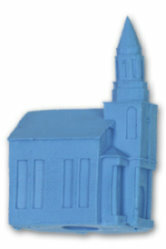 The Church shaped pencil sharpener is 2 1/2" and it has an imprint area of 5/8" X 1". With a custom imprint in the minimum of 500 they are less than $ 2.00 each. 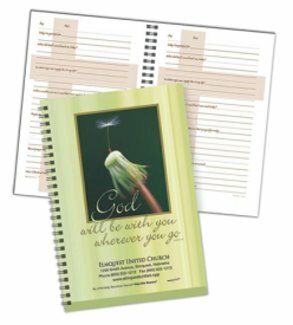 The Daily Devotions Journal opens to a 12" X 9" size and serves as a daily spiritual guide. Custom imprint on cover is 4" X 1 1/2". Less than $ 4.25 each in the minimum imprintable quantity of 100. 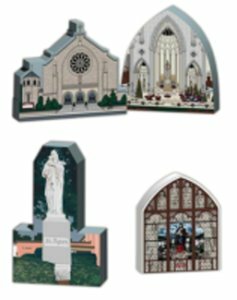 We can reproduce from your church picture a 27.5 square inch replica of your church or sanctuary. Each piece is beautifully detailed and is cut from wood with your full color image applied to the wood. The attention to detail makes these replicas treasured keepsakes for visitors, supporters and local residents alike. Minimum order is only 100. Call for an estimate at 800 960-9080. It is a combination magnifier, bookmark and ruler. 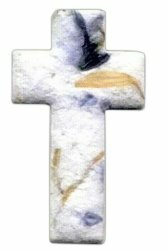 It measures 7 1/2" long X 2 1/2" wide and provides an imprint area of 1 3/4" X 1 1/4". In the minimum order of 300 they are less than a dollar each. 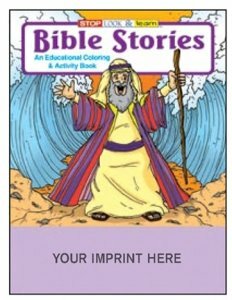 Always a hit with younger kids the Bible Stories coloring book measures 8" X 10 1/2" and provides an imprint area of 7" wide X 1 3/5" high. With your custom imprint in the 250 minimum they are less than $ .72 each. Minimum order on non-imprinted is 100 and they are $ 1.00 each. Great Sunday school and DVBS item. You can choose the pom color and also the ribbon color which will have your custom imprint Less than $ .85 each in the minimum of 250. 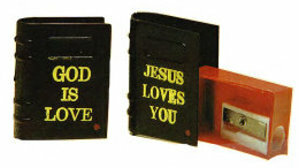 Stock Bible shape magnet measures 3 1/8" X 2 1/8" and it provides a custom imprint area of 2 3/4" X 1 1/2". Minimum imprintable quantity is 250 and they are less than $ 1.50 each with your full four color imprint. 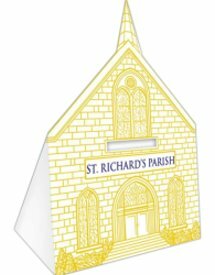 One of our most popular Church products is the church business card magnet that measures 2" X 3 1/2" and minimum custom orders can be as low as 100. 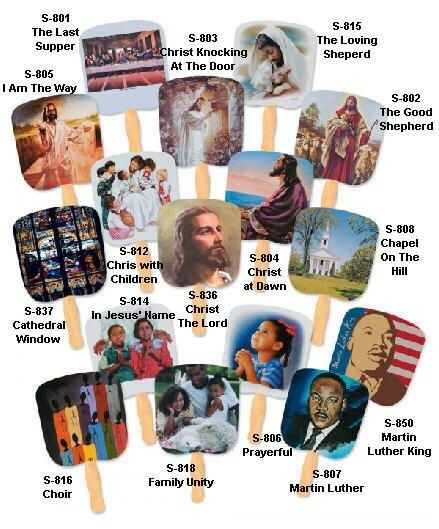 Pictured below are several examples of church magnets. Still another idea for magnetic use is that of a magnetic notekeeper as pictured below in the form of a ruler. This product measures 1" X 6" or we can make in any size you want. Below is a popular Puzzle Magnet. The pieces come apart just like a puzzle. 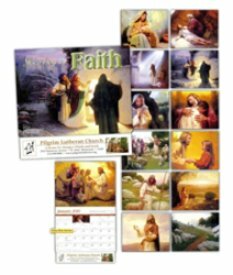 It is a great mailout product and kids love to get them at Sunday School class. Minimum order is 250 for your complete custom full color picture and text. 1.01 ea. .54 ea. .41 ea. .38 ea. .34 ea. .31 ea. 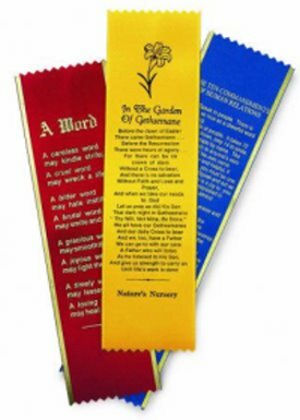 Pictured below are the stock ribbons of - The Lord's Prayer, Abundant Living and A Tribute to Mother. Here we have the Books of the Boble in both English and Spanish and The Mark of Success. Below we have the Psalm 23, A Word and Footprints in the Sand bookmarks. Pictured below are the - How to Use The Bible in either English or Spanish and the God, Grant me the Serenity stock ribbons. 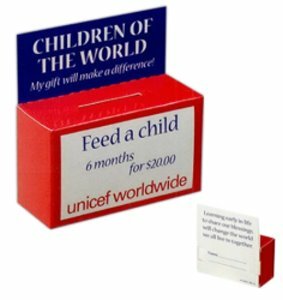 The Kid's Collection Bank is made o fwhiter chipboard and measures 3 1/2" X 1 1/2" X 2 1/4". It provides an imprint on the front, top and back of the box. Less than $ 1.50 each in the minimum imprintable quantity of 500. 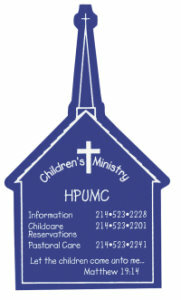 This 3 5/8" X 6" stock magnet has an area at the bottom of the magnet to put in your church information. Less than $ 2 each in the minimum imprintable quantity of 250. 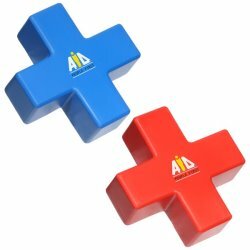 The 3 9/16" X 3 9/16" X 1 1/6"Cross symbol stress reliever is the ideal promotional product for the Easter holiday or for church fundraising events! Show your support with your logo printed on these! Safety tested and intended for adults or for general use by consumers of all ages. Our products are not intended for children under three years old or for pets. It provides a custom imprint area of 5/8" X 3". Less than $ 2.00 each in the minimum of 150. 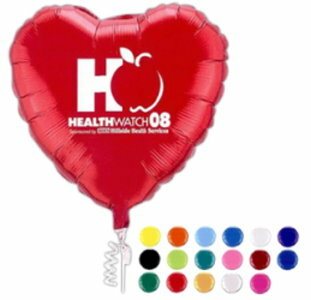 Pictured below are some of the stock designs that are available for the latex or mylar balloons. 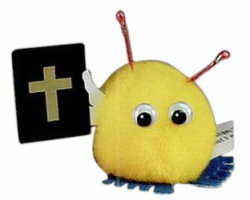 We have many types of Weepuls available and are presenting several below for your churches consideration. You can choose the color of the pom, the rbbon and feet. 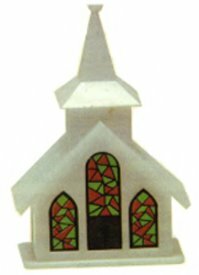 Your church message goes on the ribbon and these are great items for visitors, DVBS or Sunday School awards. The Bus Savings Banks are made of 20 point posterboard measures 5 3/4" X 2" X 2 1/2" and it provides an imprint area of 1 1/4" X 4" and in the minimum quantity of 250 with your custom imprint they are less than $ 1.05 each. 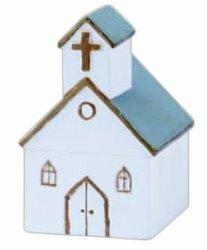 The Church Stress Reliever measures 2" X 3 1/2" X 2 1/2" and it provides a custom imprint area of 1 1/2" X 3/4". In the minimum quantity of 150 they are less than $ 2 each. 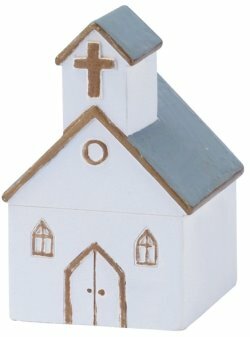 The 1 1/2" Bible pencil sharpener is less than $ 1.40 each in the minimum of 500. Church shape pencil top eraser. The pencil top eraser is recommended for use on ferruled or unpainted pencils only. Caution: Erasers are not intended for use by children under 3 years of age. Made in USA. Available in Blue, Green, Orange, Pastel Pink and Yellow. Less than $ .19 each in the minimum of 1000. 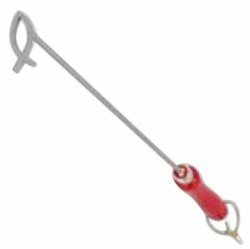 Made of stainless steel the Jesus branding iron measures 14" in length and has a wood handle. Minimum quantity is only 5 and is a great award for church volunteers.